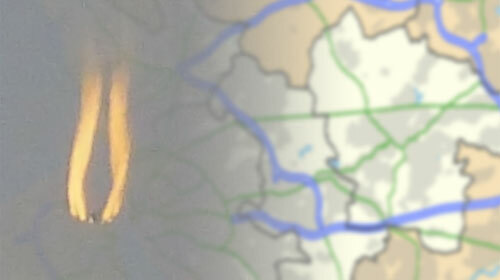 A woman saw an unusual object in the sky above the Merseyside town of St Helens in England on Wednesday, October 3. The witness, Lilia Hughes, was walking in historic Taylor Park when she noticed the UFO. She explains to the St Helens Reporter, “It looked like a bright yellow spot in the western direction of the sky, just above the clouds.” She says the anomalous object did not move during the five-to-eight minutes in which she watched it. 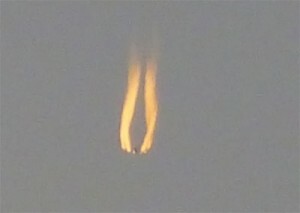 She was able to photograph the object with her digital camera, and she sent it to the St Helens Reporter. She apparently contributes regularly to the St Helens Reporter’s “picture of the week” feature. But this was presumably her first submitted UFO photo. Similar objects have been photographed and captured on video before. 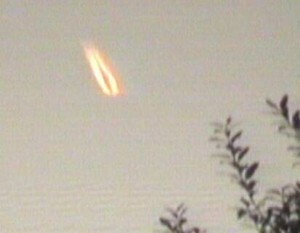 Some fireball UFOs with this appearance have been determined to be airplanes with contrails illuminated by the sun. One such instance occurred in the Czech Republic, where researchers, including ufologist Karel Rasin, concluded that a similar mysterious object was a Learjet 60 plane with an illuminated contrail giving the object its fiery appearance. The illusion of a hovering, motionless object in the sky can easily be created by the trajectory of a plane and a witness’s vantage point. An airplane is the most likely explanation for what Hughes photographed. But it is possible that it is something else entirely. Share your opinions with us by leaving a comment below, or post your comment on our Facebook page. > But it is possible that it is something else entirely. You do not believe that so please don’t write it. It’s naked pandering and it insults your readership. Definitely a plane, probably a 747, if you look engines 2 and 3 point in slightly different directions from 1 and 4 so you get a twist effect to the contrail See them all the time over our house, 20k or 30k feet up.